Just because it is invisible doesn’t mean it is less profound. Recall some of the most important things we humans are naturally equipped with from breathing, thinking, setting goals, to our level of bravery. They are all invisible to the human eye. For progress to occur one has to work ferociously on all that is invisible. Developing the invisible is more significant for becoming the person you have always wanted to be. Make the invisible your best friend. Cherish, grow it daily by feeding it the right amount of attention. What can you do in an environment where you often get rewarded and/or noticed because of the visible? From buying the newest technological gadget to getting those 80 dollar diet pills which this time “guaranteed“ going to work. Increase your willpower. How can one increase their willpower? The most effective way is to work on your level of imagination. Visualize how it will be when you are already in that state where you can easily say ‘no’ to the unnecessary. Spend more time in nature. She has been around for billions of years and has developed this invisible system where all just works. Learn from her and indulge yourself in her beauty. If you become an excellent observer of nature you will develop a keen understanding of human psychology. Develop your heart. 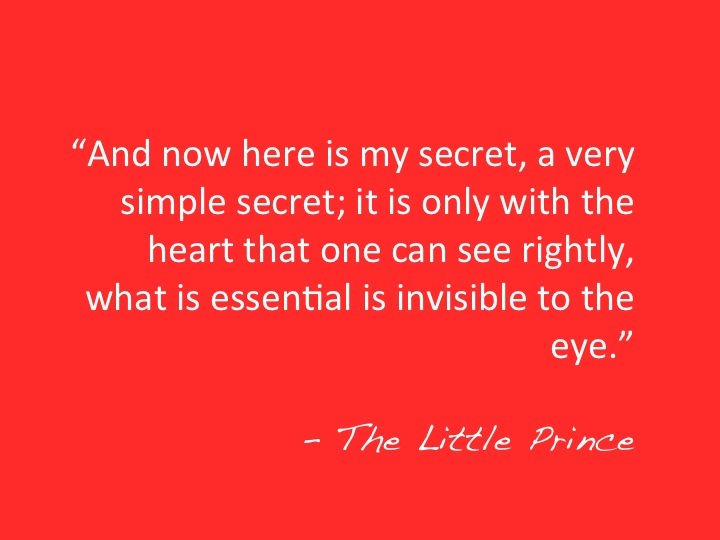 “It is only with the heart that one can see rightly, what is essential is invisible to the eye.” Nobody said it better than Antoine de Saint-Exupery. If you develop your heart more you will be less in need of the material. Don’t get me wrong we all need material tools to survive in this modern life, but don’t let the material get in the way of what is really important. Don’t listen with your ego or history, listen with your heart and present. Develop the heart so it becomes the compass to inner beauty. Don’t rush. All that is essential needs an adequate maturation process. If you are not familiar then check out the famous marshmallows experiment led by psychologist Walter Mischel from Stanford. The kids that waited ended being more successful as adults later in their life. Question the so-called obvious. Just because it is out there, common or conventional wisdom doesn’t mean it is true. Remember that the earth was once flat 🙂 Question, ask deep killer questions and answer them with lateral thinking. Remember society hardly changes by a group. It changes by that brave individual who saw something else then others and acted on it. Be that person.